From medieval witch hunts in Europe to contemporary "witch doctors" in Tanzania, belief in witchcraft has existed across human societies throughout history. Anthropologists have long been fascinated by the phenomenon, but have struggled to study it with quantitative methods—our understanding of how and why it arises is therefore poor. But a study we conducted of one Chinese region provided an opportunity to test the most common hypothesis—that witchcraft accusations act as punishment for those who do not cooperate with local norms. According to this theory, witch tags mark supposedly untrustworthy individuals and encourage others to conform out of fear of being labeled. However, some empirical studies have shown that witch labeling instead undermines trust and social cohesion in a society. Our study is based on 800 households in five villages in southwestern China. We examined the social behavior of those who were labeled with a "witch" tag, and compared it with those who were not. The work, published in Nature Human Behavior, was the basis of a long-term collaboration between scientists from University College London, the Chinese Academy of Sciences in Beijing and Lanzhou University. To determine the social networks and cooperation between households, we conducted house-to-house surveys, asking who had children, marriages and partnerships with whom. We also collected data on gift-giving, and on working groups on farms during harvest and planting seasons to see who was helping other households with their farming. All these measures gave rise to four social networks between households based on kinship, reproductive partners, gifts exchanged or farm work. While in the area, we were occasionally warned not to eat in certain households, as women there were believed to be supernatural "poison givers." The label they used, " zhu" or " zhubo," is sometimes also translated as "witch." It was common knowledge which homes were so labeled and we were surprised to find it accounted for 13 percent of the households. The tag was one of the strongest predictors of assortment on social networks. Those from tagged households rarely had children or partnerships with those from untagged households, nor did they exchange gifts or work on each others’ farms very often. However, tagged households were helping each other and reproducing with each other, which mitigated the costs of exclusion from mainstream social networks. We also played an "economic game" in the villages, where each person was given a small sum of money and asked to donate any proportion of it they wished to the village (to be divided among all the players). We found no evidence that those tagged as "witches" were any less cooperative in this game than any others. In fact, we found that labeled households were very similar to other households, except the tagged households were more likely to be headed by women and were actually slightly wealthier than average. We also discovered that the process of acquiring the label was opaque. Even victims often did not know who had started a rumor about them, they may just begin to notice others avoiding them. Some sources report such tags running in the family, with daughters inheriting the status from their mothers. Hence the origin of the slur could have occurred long ago. Anthropologists who believe that the fear of loss of reputation (by witch labeling or other reasons) can be a huge driver of cooperation in the wider community often back their arguments with laboratory experiments using economic games. Such experiments also show that those who punish transgressors can gain reputation benefits themselves. However real world examples of this are hard to come by. Most studies of witchcraft are not quantitative and do not examine social networks as we have done. While this study suggests there is no evidence that those labeled with this harmful tag were uncooperative, it does not fully explain why such accusations stick in some cases and not in others. Our conclusion is that witch accusation has evolved from competition between households. Labeling may have become a way for people to get ahead of their rivals and gain a competitive advantage in reproduction or resources. However, the sources of competition may be different in different cases. There are other explanations that may apply too. All around the world conceptions of witchcraft share many common features. For example, middle-aged women are the most common victims, and accusations of poisoning are frequently involved. But there are also many differences. 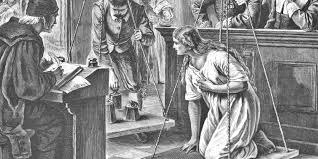 Another idea for the origins of witchcraft denunciations is that they are common when patriarchal institutions are trying to establish dominance over matriarchal ones. This could possibly also apply in this case as Buddhism, the most common religion in the area, is more male-dominated whereas the traditional social structure in the region is "matrilineal," where descent is usually traced through the female line. A patriarchal dimension to witchcraft accusations could also explain the prevalence of women as victims both in traditional societies, and even in modern contexts that can resemble "witch hunts," such as online bullying specifically targeting women. The more research we do, the closer we can get to understanding and tackling the mechanisms behind these practices that can be devastating for women across the world. Mary Marston left prison around this time after a twenty-week stay. Sarah, wife of Salem tailor Abraham Cole, was bailed out with L50 put up by her husband before Justice John Hathorne. 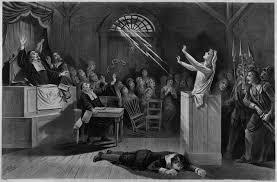 Besides one probate matter, the two-week session had heard over fifty witchcraft cases. It discarded thirty as ignoramus, including that of Sarah Cloyse (whose two sisters had hanged for had hanged for witchcraft). 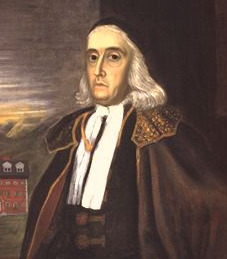 Sarah's husband Peter soon moved them from Salem Village to Boston. Of the twenty-one defendants tried, only three were found guilty--Elizabeth Johnson Jr. and Mary Post ("two of...the most senseless and ignorant creatures that could be found," in Robert Calef's opinion), and Sarah Wardwell. Stoughton signed a warrant for their "speedy execution" (probably set for February 1) along wth five others condemned under the old Court of Oyer and Terminer: Abigail Hobbs, Mary Bradbury (who had escaped and was still in hiding), Abigail Faulkner Sr. and Elizabeth Proctor (whose month reprieve to put her soul in order had long expired). King's Attorney Anthony Checkley relayed the court's decisions to Governor Phips, and added that he could see little or no difference in the cases of those cleared and those condemned. In Checkley's opinion, the three found guilty were as innocent as the rest. Phips had been in Rhode Island during the first week of the trials, making sure that that government knew where its boundaries lay. Now he mulled over Checkley's report, along with the news of Stoughton's execution warrant. The 14th card of the Major Arcana is Temperance. The figure shown is a guardian angel who protects us and keeps us on an even keel. 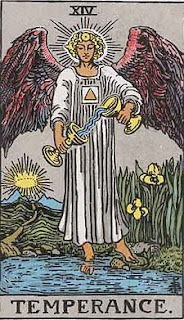 Temperance highlights the need for balance and moderation in the lives of January 14 people. Positively seen the angel modifies passions in order to allow for new truths to be learned and incorporated into one's life. The Temperance card urges January 14 people to establish their own ethical code and resist those seductive temptations that would lead them toward false behavior for personal gain.